What Are Sanctuary Cities and Why Do They Bug Trump? 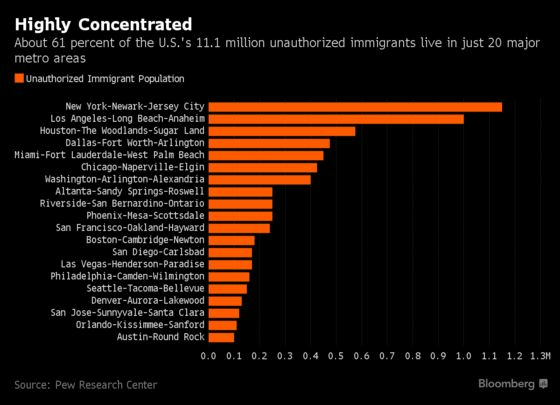 (Bloomberg) -- So-called sanctuary cities, which refuse to comply with U.S. immigration-enforcement efforts, have been a target of President Donald Trump virtually since the day he took office. By executive order, he threatened to block federal funding to such jurisdictions. Now he says immigrants in the U.S. without authorization will be "given" to sanctuary cities once they no longer can be detained. 1. What’s a sanctuary city? While there’s no official legal definition, the label generally applies to cities (or counties, or other jurisdictions) that declare they won’t assist in immigration enforcement and deportation. The phrase has been used for decades by some county and municipal governments to show that they welcome undocumented aliens. The spirit behind the movement dates back to the 1980s, when hundreds of U.S. churches and synagogues provided safe haven to Central Americans fleeing civil conflicts. One of the first big cities to join was Los Angeles, where the city council in 1985 voted to oppose the deportation of law-abiding Central American refugees. Other early adopters were Berkeley, California; Cambridge and Brookline, Massachusetts; Madison, Wisconsin; and Takoma Park, Maryland. 2. How can they legally do this? In a 1997 ruling, the Supreme Court held that the federal government can’t require state officials to enforce federal law, a doctrine known as the "anti-commandeering principle." 3. Do sanctuary cities offer genuine sanctuary? No. There’s no U.S. jurisdiction beyond the reach of federal immigration authorities. Policies in sanctuary cities, however, can make it less likely that an undocumented alien will come to the attention of federal officials or wind up in their hands. Many sanctuary cities refuse to honor "ICE detainers," or requests from U.S. Immigration and Customs Enforcement to hold someone in custody for an additional 48 hours. 4. How many sanctuary cities are there? There’s no definitive list. The San Francisco-based Immigrant Legal Resource Center, which supports the sanctuary movement, says at least 635 U.S. counties -- more than one in five -- refuse to hold people in jail on federal detainer requests, while at least 53 counties, or about 2 percent of the total, prohibit using local resources to assist federal immigration enforcement. In 2017, the Trump administration cited 118 local governments as having refused to comply with detainer requests during one week in January. 5. What is Trump’s objection? 6. What’s he doing about it? Trump’s announcement on Twitter that he would seek to send migrants to sanctuary cities also said that "Congress must fix the laws and loopholes" he sees as forcing their release. It isn’t clear how such a program of shipping migrants to sanctuary cities would be carried out, including how they would be kept from leaving those areas. Trump’s latest idea for sanctuary cities has him facing off with California, again. Trump’s 2017 executive order on sanctuary cities. A QuickTake explainer on refugees, political asylum and Trump. "Searching for Sanctuary," a report by the Immigrant Legal Resource Center. Trump profits from migrants even as he demonizes them, Timothy L. O’Brien writes in Bloomberg Opinion.